Here is an irreverent, insightful view of U.S. farm programs, clearly separating political rhetoric from economic reality. Analyzing the effects of price supports, marketing orders, credit and export subsidies, and other farm programs, Professor Pasour shows how they especially hurt the small farmer and victimize the general public. He also exposes current farm policies as being responsible for high food prices and the widening destruction of the environment. This book sets forth how only through abolishing the gravy train of farm subsidies and other special privileges will American consumers find relief and American agriculture achieve significant economic progress. Economists are nearly unanimous in their denunciation of this wasteful and pernicious web of policies. Subsidies for not growing crops are so notorious among the general public that they have been the object of biting political satire since their introduction in the 1930s. Yet surprisingly, not one full-length book, critically analyzing the federal government s farm program in its entirety, has ever appeared. That is until now. 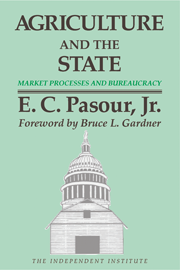 Ernest C. Pasour, Jr., Professor of Economics North Carolina State University, has completed a remarkably lucid volume on this abstruse subject for The Independent Institute. The book s foreword is written by Bruce L. Gardner, former Assistant Secretary for Economics in the U.S. Department of Agriculture and Professor of Economics at the University of Maryland. The book consists of twenty chapters. The first seven focus on the public policy process. Among the questions addressed are: (1) what is the role of economics and the economist in public policy analysis and (2) what is the origin of the network of unique programs affecting U.S. agriculture? Agriculture and the State contrasts the market process with the political process. Three chapters devoted to the theory of public choice demonstrate how economic principles can be used to explain decision making in the political process. There is an overspending bias in agricultural policy because of the separation of power and responsibility by elected and appointed public officials charged with formulating, administering, and evaluating farm programs. Farm programs have been rationalized in the post on public interest or market failure grounds. In this approach, government intervention is justified because agricultural markets do not conform to the ideal of perfect competition. Pasour stresses, however, that the political process in agriculture has similar flaws; real world political institutions affecting agriculture fall short of a perfect polity. Consequently, the emphasis throughout Agriculture and the State is on a comparative institutions approachagriculture (and other) markets in the real world compared with the political process in the real world. Its concludes that government failure rather than market failure better explains the persistence of wasteful and inconsistent farm programs. Pasour s wide-ranging survey scrutinizes every government intervention that affects agriculture. Two chapters describe the operation of price support programs, including the arbitrary and indefensible parity and cost of production approaches to setting the level of price supports. The remainder of Agriculture and the State addresses various other farm programs and analyzes their economic effects. It looks at marketing orders, food stamp and other subsidized food programs, trade protectionism, crop insurance, subsidized credit, conservation programs, research and education programs, and taxation. Pasour compellingly illuminates the economic effects of the Rube Goldberg system of price support programs without getting bogged down in confusing and complicated details. The last chapter summarizes the total impact of the network of farm programs. In doing so, Agriculture and the State presents data showing how outlays in various categories have changed over time. The categories include direct payments and price supports, subsidized food programs, credit programs, conservation, and research and education. The book also considers two alternatives to current farm programs: decoupling and strict supply controls. Under decoupling, farm production would be based on supply and demand, price supports and other trade restrictions would be eliminated, and any transitional income payments would be unrelated to amount of production. The Harkin-Gephardt Save the Family Farm Act represents a stark contrast. Senator Harkin and Representative Gephardt have proposed that the tobacco program of strict supply controls be extended to other farm commodities. This Fortress America approach represents a reactionary throwback to the cartelization initiatives of the New Deal era. Such a protectionist approach is not an enlightened or realistic alternative in an increasingly interdependent world. The GATT objective of liberalized and expanded world trade is as much a dire necessity in agriculture as in other sectors of the economy. By detailing the disastrous impact of the federal government s ill-conceived, century-long favoritism towards large-scale farmers, Agricultural and the State fills in a too-long neglected scholarly gap. Only this kind of searching critique has any hope of making the policies assailable politically in the interest of farmers, consumers, and taxpayers alike. Ernest C. Pasour, Jr. is Professor of Economics and Business at North Carolina State University.